Before you start installing plugins on your site, it’s important for you to explore the Plugins page on your WordPress Dashboard and understand how to manage the plugins after you install them. Click the Installed Plugins link in the Plugins menu on your WordPress Dashboard to view the Plugins page. 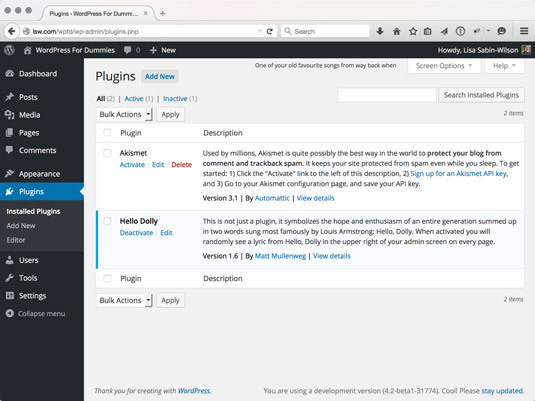 Manage your plugins with the Plugins page on the WordPress Dashboard. All: This is the default view for the Plugins page and shows a listing of all plugins currently installed on your WordPress website, whether they are active or not. Active: Clicking this link shows a list of the plugins that are currently activated and in use on your WordPress website. Recently Active: This link appears only if you have deactivated a plugin recently. It’s helpful if you know that you’ve deactivated a plugin, but cannot remember which one. Must Use: This link appears only if you have plugins installed in the /wp-content/mu-plugins folder. Must-Use plugins are standard WordPress plugins that need to be manually installed (usually by a developer) and do not give the site administrators the ability to remove or deactivate them from the Dashboard. Drop-Ins: A few select plugins actually have files that change the behavior of WordPress so substantially that it lets you know about it, just in case there’s a question later. These plugins drop files into the wp-content directory that modify the core settings of WordPress (mostly having to do with caching or other server-specific settings). These files don’t show up in the main plugin listing because they typically belong to other plugins. The Drop-Ins link appears only if you have drop-in plugins installed. With a quick glance at the Plugins page, you can easily tell which plugins are active — and which aren’t — by the background color of each plugin listed. A blue background means that the plugin is active. A white background means that the plugin is not active. The background of the Akismet plugin is white and the background of the Hello Dolly plugin is blue. Akismet isn’t active, but Hello Dolly is. You can mass-manage your plugins on the Plugins page. You can deactivate all your plugins simultaneously by selecting the box to the left of each plugin name and then selecting Deactivate in the Bulk Actions drop-down menu at the top or bottom of the page. Then click the Apply button. Likewise, you can activate, upgrade, or delete the plugins listed by selecting Activate, Update, or Delete in the Bulk Actions drop-down menu. To quickly select all your plugins with one click, select the box to the left of the Plugin heading on the Plugins page. Activate: This link appears below the title of only inactive plugins. Click the link to activate a plugin. Deactivate: This link appears below the title of only active plugins. Click the link to deactivate a plugin. Delete: This link appears below the title of only inactive plugins. Click the link to delete the plugin from your site. Edit: This link appears below all listed plugins, whether they are active or not. Click the link to visit the Edit Plugins page. If you feel comfortable doing so, you can edit the individual plugin files. Sometimes, a plugin will have a separate settings page; in that case, an additional link labeled Settings is displayed underneath the plugin name. Clicking that link takes you to the settings page for that plugin. Description: This column lists a description for the plugin. Depending on the plugin, you may also see brief instructions on using the plugin. Directly below the description are the version number of the plugin, the plugin author’s name, and a link to the website where you can read more information about the plugin.